Pick your favorite color bottle cap color! 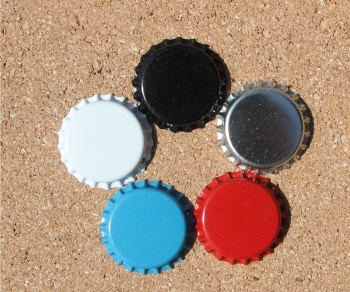 This is a great shiny bottle cap that comes in many colors: black, blue, red, white and silver. These caps are great for the middle of a bow or unto a necklace. There is a circle on the top of each cap where you can drill a hole for the necklace to go through. Add this to your cart with a bow you choose and say in notes section that you would like to add this on to your bow. Add on engraving for a First initial in a Mono Curls font or Monotype Cursiva font on the bottle cap.